In this article, we’ll show you step by step, how to make your own website for 2018 and 2019. In this WordPress website tutorial for beginners, we’ll show you how to create a website that would typically cost two to three thousand dollars plus, if an agency or web designer was building it for you. The great news is, we’ll show you how to do this for less than a few hundred dollars. Because everyone is different, we’re going to show you how you can access over 25 professionally designed free layout packs that you can choose from to build the exact type of website you want. So, regardless of what type of website you want to build, we’ll give you the tools to do it. We’ll show you how to make a website that’s SEO friendly, features an optimized UX design that is 100% mobile responsive, and includes an intuitive, beginner friendly, drag and drop page builder. Our intention is to give you as much flexibility in design as possible so that when we show you how to create your own website, it’s actually the one you want! A big mistake beginners often make is forgetting to plan out what they want their website to look like before getting started. By taking a couple of moments upfront to consider the user experience, as well as brand and content design, you’ll save yourself a bunch of time, and produce a much better result. User experience or UX design is the process of planning the content and structure of your website to optimize the user experience. For this, take out a sheet of paper, or open your favorite drawing tool. Then sketch out the pages you want to include on your website and how they relate to each other. Some of our favorite free tools for this include sketch.io, and if you need to collaborate with others, check out InVision. Next, for each page, create a rough guide for what will be on the page in terms of text, images, videos, and other elements. You can use the layout pack you want to use as a guide. Give some thought on how you structure your content. If it does, this will dramatically improve engagement on your website. In this tutorial, we’ll show you how to make a website that would typically cost two to three thousand dollars. For this, you’ll need a small budget of around $100 – $300. Congratulations! You officially have a new website! It’s not much at the moment, but you’re well on your way. We recommend that you add your free SSL certificate which will encrypt the data on your website. This is good practice as it improves the security of your website, improves your search rankings as Google prefers secure sites, and allows you to take payments on your website as well, in the event that you want to include an online store as part of your website. If you want to update your user profile or add users to your website, you can do this by hovering over ‘users’ in the admin menu on the left, and selecting from the options there. For this tutorial, we’ll use on of the highest rated WordPress themes – Divi by Elegent Themes. To access an exclusive discount, follow the link below. Head to the Elegant Themes website, and click ‘Join to download’. You can either purchase a yearly access to all of their themes and plugins, or select their lifetime access option, which gives you access to all of their theme and plugin updates for life. Once you’ve chosen your access level, select ‘sign up’. Then, log into your Elegant Themes dashboard. From your Elegant Themes dashboard, scroll down to where you see ‘installing Divi’ and select ‘download’. This will download a copy of the Divi theme which will be a .zip file. Next, we’ll upload the Divi WordPress theme. If you want to install a child theme you can either use our free child theme generator. Alternatively, you could also use a plugin called Child Theme Configurator to help set this up. This is best practice but not essential. Go to your WordPress dashboard. Hover over appearance in the admin menu on the left, and select ‘themes’. Navigate to the .zip file you downloaded earlier, and select ‘Open’. Click ‘Install now’. This will start the process to upload and install the Divi WordPress theme. Once the theme is successfully installed, click ‘activate’, and you’re new theme will now be live on your website. Unlike other themes, Divi doesn’t require you to install any additional plugins to leverage all its features. However, if you want to include any additional plugins on your website, review our article and video on how to install a WordPress plugin, which you can find on our blog or YouTube channel. One of the great things about the Divi theme (other than its industry-leading page builder), is the ability to access an unlimited number of layout packs that you can use on your website. So, what exactly is a layout pack? A layout pack is a group of JSON files that include a series of page layouts that can easily be imported into your new website. These include all the content, Divi settings, images, and other design elements, making it really easy to create a great looking website. From there, you can update or amend the design to create the exact website you want. In a recent update, you can now access a number of these pre-designed layouts or layout packs directly from the Divi builder. To launch the Divi builder and leverage the pre-designed layouts, we’ll click on the ‘Use the Divi Builder’ button. We’ll go through how to use the Divi Builder to create and update pages on your website in the following section. However, to access the pre-designed layout for this page, we’ll click on ‘load from library’. Under the ‘premade layouts’ tab, you can access any of the pre-designed layouts by clicking on the layout you want to use. In this case, we’ll click on the ‘Divi for business’ Agency layout pack. Then navigate through the various pages, and choose the page layout you want to use. For this page, we’ll select the landing page layout. From here, you can either view the demo in a new tab or click ‘Use this layout’ to import the layout into your page. You’ll see that our Divi Builder is now populated with content. We’ll go through a practical example of using the page builder shortly. For now, we can save the page as a draft if we’re not ready to publish the page. Preview the page, which will preview what the page looks like from the front end. You’ll see that the layout has imported all the content from the demo, which is great. If we head to the back-end and we’re ready to publish the page, we can hit ‘publish’ and that will take the page live. We’ll create the other six pages that we’ll use for this demo and import the content just like we did for this page. The pages we’ll create will be called ‘Home’, ‘About’, ‘Contact’, ‘Blog’, ‘Portfolio’, and ‘Pricing’. From your WordPress dashboard, hover over ‘Divi’, and select ‘Divi Library’. This is where you’ll manage any saved page layouts, sections, rows, or modules that you can easily load into pages with a couple of clicks. Click on the ‘import/export’ option at the top of the page. Click on the ‘import’ tab, and select ‘choose file’. Navigate to the JSON file with the layout or layouts you want to upload and select ‘open’. Then, click on ‘import Divi Builder layouts’. You’ll then see a progress bar. Once it’s uploaded you’ll see that the layout or layouts have now been added to your Divi library. And that’s how you upload any Divi Layout that isn’t featured on the premade layouts tab. Under the ‘Your homepage displays’ option, make sure that ‘a static page’ is selected and then choose the page you want to set as your homepage from the homepage dropdown list below. In this case, we’ll choose the page called ‘Home’. If we go to the homepage of our website, we’ll see that the page we just created called ‘Home’ is now our homepage. Ok, so that’s how you’ll set the homepage for your website. If you want to include a blog on your website, you’ll create blog posts the same way. The only difference is that you’ll need to set up categories first. The default blog page will feature your recent posts unless you create a custom blog page and set it as your blog page via the reading settings tab like we just did for the homepage. In WordPress, menus are managed in their own dedicted section. To create the menu structure for your website hover over ‘appearance’ in the admin menu, and select ‘menus’. Under screen options, you can enable the ability to set the link target for a menu item, which means whether the link opens in a new tab or not, as well as assign CSS classes. We’ll check both boxes as we’ll show you how to use the link target option to open a menu link in a new tab and how to include a mega menu on your website by adding a CSS class to the menu item. 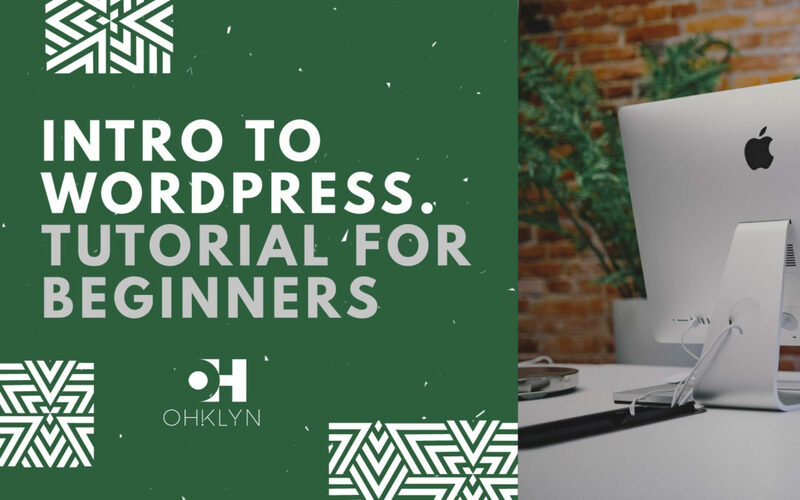 If you’re interested in learning some HTML and CSS fundamentals for WordPress, register for one of our courses at courses.ohklyn.com. On the right, you have your menu structure. To create a new menu click on ‘create a new menu’. Enter a name for the menu (this is for your reference). Footer navigation menu (located in the footer section of your website). We’ll set this menu as our main navigation menu. Divi also allows you to include mega menus which can be great from a UX perspective as they allow you to show large amounts of information in an efficient way. Click on the blog menu item. If you’ve checked the ‘CSS classes’ box under the screen options at the top, you’ll notice there’s a field called ‘CSS Classes’. Add the class name of mega-menu to this field. Then navigate to the front-end and refresh the page. It will take some finessing, but this can be a powerful feature. Follow the button below and search for ‘Mega Menu’ for more info. Divi theme options: where you’ll set the logo and favicon for your website, control your default page and post layouts, amend the visibility of global elements like social icons and metadata, as well as integrations for things like Google maps, social media, etc. Theme Customizer: Where you’ll manage your global styling parameters, such as colors, fonts, menu styles, etc. Widgets: How you populate your sidebar with content and other widget enabled areas on your site. Firstly, we’ll take a look at the Divi Theme options section. To access the Divi Theme options section, from your WordPress dashboard, hover over ‘Divi’, and select ‘Theme options’. In the theme options, you’ll notice that there’s a number of tabs along the top. To access the theme documentation for the Divi Theme Options section, follow the button above and search for ‘Divi theme options’. Before we go through each of them, let’s cover some common vocabulary that relates to the basic architecture of WordPress so that these make more sense to you as we go through them. Individual posts are the blog posts you create that are relevant to your business, industry, or niche. Individual posts are grouped by categories which serve as an organization tool and provide additional context and meaning to users. Tags can also be added to individual posts. 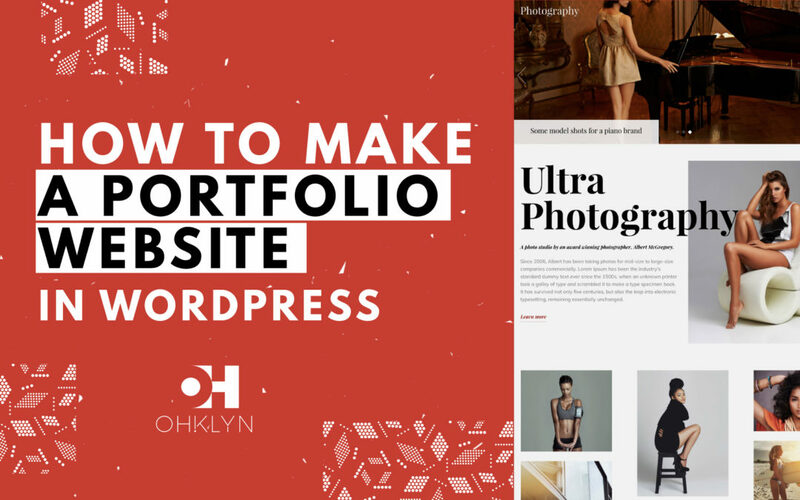 Individual portfolio posts are most commonly used to showcase examples of work, or case studies, etc. These function in a similar way to individual posts, where they are associated with a category. Archive pages are typically the category pages and showcases the individual posts or portfolio posts associated with that specific category. Essentially, these pages act as an archive of associated posts. For example, if you are a fashion brand and want to include a blog on your website, you may want to have a category called ‘Lifestyle’ with a number of individual posts related to ‘Lifestyle’ related keywords or topics related to your niche. If you were to click on the ‘Lifestyle’ category link on your website, you would be taken to the ‘Lifestyle’ category archive page, which would display all the posts related to the category of ‘Lifestyle’. This page is what’s referred to as an archive page. Ok, so hopefully that makes sense and we can now go through the Divi Theme options. In the ‘Divi Theme Options’ section, the first tab is the ‘general’ tab and is the tab where we’ll spend most of our time. This is where we’ll upload our logo and favicon. To update your logo, go to the logo option and select ‘upload’. You can select your logo from your media library if you’ve already uploaded it. If you haven’t, you can drag in your logo, or navigate to ‘upload files’ and click ‘select files’ to upload your logo. Once your logo is added to the media library, select your logo and add an alt text like ‘your brand name and the word logo’. Adding alt text to all images used on your website is good practice and something we’d recommend doing. Then choose ‘set as logo’. Next, we’ll follow the same process to add a favicon to your website. A favicon is the icon that appears in the browser tab when a user is on your website. Your favicon image will need to be square, however, it can be a .png image if you want to include a brand element that isn’t square. To upload your favicon, next to the favicon option, select ‘upload’. Either select your favicon from your media library or upload it. Then select your favicon, add an alt text and then choose ‘set as favicon’. For each of the available options in this section, you can hover over the question mark icon on the right-hand side to see more information about each specific option. If you have a brand color palette, we recommend adding it to the ‘Color Pickers Default Palette’ section here, as this will make your color palette available anywhere throughout your site where you have the option to set a color. If you want to add a Google map to your website design, you’ll need to set up your Google Maps API key and paste it into the field on the general tab of the Divi Theme options. Follow the button below and search for ‘Google map’ for the step by step instructions. Similarly, you can enable the default social media icons on your website here by enabling the options you want on the general tab, and add your social media links. We find this feature from Divi limiting because of the limited options available without needing to amend the base code. We prefer to disable these and instead, import font awesome instead which enables us to add any social icon to our website and add the links anywhere on our site. Lastly, from within the general tab, you’re able to set the number of default posts shown on the various types of pages. Underneath that is a number of options including a back to top button on your site that you may want to utilize. At the very bottom is where you can add custom CSS to your website. You can also add Custom CSS via the Theme Customizer panel which we’ll explore next. Whenever you make changes, remember to hit the ‘save changes’ button at the bottom to commit your changes. Navigation – Here you can control the visibility of specific elements related to pages, categories, and your navigation menu features. Builder – the Divi Builder was recently upgraded to move away from adding what’s referred to as ‘inline CSS’ into your web pages when you make customizations to your page. This is huge, as many drag and drop builders add Inline CSS, and if you know anything about web design best practices, inline CSS is a major rookie move. In this tab, you have a few options that relate to how the CSS is generated on your site (which we wouldn’t recommend changing), as well as the ability to turn off the product tour feature. Layout – This allows you to control the look and visibility of elements included on individual posts and pages. Ads – As the name suggests, this allows you to integrate ads on your posts. SEO – We prefer to use the Yoast SEO plugin to optimize the on-page elements of our website, however, you have control over some of these elements here. Integrations – here you can add your Facebook pixel, Google Analytics code, or any additional code to your website. Updates – This allows you to add your Elegant Themes username and API key to enable Divi theme updates from within your WordPress dashboard as Divi improves and evolves. Ok, so that’s an overview of the fundamentals everyone should know about the Divi Theme settings. Review the help (or question mark) icon next to each option for further definitions, or follow the link below to the Divi Documentation and search for ‘Divi Theme Options’ for a more detailed overview of each element. Before we take a look at the Theme Customizer which allows you to set global fonts, colors, and other styling attributes on your site, let’s quickly explore widgets. If you’re new to WordPress, we would recommend reviewing the documentation to get your head around widgets and widget-enabled areas as they are a powerful feature. Widgets are managed in their own dedicated section which you can access by hovering over ‘Appearance’ in the admin menu on the left-hand side, and selecting ‘Widgets’. Divi has the sidebar widget area which appears on individual posts, archive pages, etc. As well as four footer widget areas that you can use depending on which footer layout option you choose in the Theme Customizer which we’ll cover off next. By default, there may be some widgets added to your sidebar. Depending on the layout you’re using, this may or may not be displayed, however, this can very easily be added. Pro tip – Search for the ‘Divi Sidebar Module’ from the Divi documentation section. This guide will show you how to use the Sidebar module which will be implemented on a number of the blog pages for the layout pages included in the free Divi layouts. Ok, so we’ve covered the Divi Theme Options and had a quick look at widgets, let’s move on to the Theme Customizer options. Go to your website dashboard, hover over ‘appearance’, and select ‘customize’. You could also hover over ‘Divi’ and select ‘Theme Customizer’. On the left is the customization panel, and on the right is a live preview of your website. One thing to note before we get started is that the module settings for the layouts and elements on each page will override the global settings that are set via the theme customizer. Under the site identity tab, is where you can add a ‘site title’ and ‘tagline’ for your website. If you haven’t uploaded your favicon via the Divi theme options, you could also upload it here. Next is the layout settings, here you can enable a boxed layout, adjust the default content widths and heights for your site, as well as set your website’s default accent color. For this example, we’ll set ours to #0ddadd, by clicking on the color picker. Because we added our brand color to the palette earlier we can easily select it from the pre-loaded options. Whenever you make any changes, remember to publish changes by clicking on ‘publish’ at the top. If we go back, the next option is ‘typography’. Here we can set our default header and body fonts. You can choose from a number of free web fonts and a number of Google fonts. In this case, we’ll set ours to ‘Raleway’ for both the header and the body. Below that you can set your body link color, which we’ll set to our brand color. Then there’s the default header text color and body text color, which we’ll leave as is but you could set this to suit your design. Remember, if you choose to use a layout from the library where the fonts are set at the module level, these will be overwritten. To ensure the font you set here is used throughout your site, you’ll need to reset the font option for the specific module via the Divi Builder which we’ll cover next. Let’s go back. The last option for this section is the background settings. Here you can set a default background color for your website or upload an image or texture. Here, we can set the header format by selecting a header style. This includes the default option where you can enable the vertical navigation option, or opt to hide the navigation until scroll. There is also the Centered logo option, Centered inline logo option, Slide-in option, or the Fullscreen overlay option. The Primary Menu Bar options allow you to control the height, width, and colors of your main navigation bar, as well as the size of your logo. Depending on which header style you go with, you’ll either have access to the secondary menu bar settings, or the Slide In and Fullwidth header settings. These will look similar to the settings in the primary menu and allow you to further customize your website. Next is the fixed navigation settings which refers to the sticky menu or the menu that sticks to the top of the browser when the user scrolls down the page. You can amend the fixed (or sticky) header options by following the same process. You’ll notice that the options are very similar to the settings we went through in the primary navigation panel. Lastly, is the Header elements tab. Here you can enable or disable the social icons (if you’ve populated these via the Divi Theme Options), and the search icon. You can also choose to show a phone number or email which will enable the secondary menu and feature this information above the primary menu. Under the footer options tab you can set you can set the global footer for your website. This requires choosing a column layout under the layouts option and using the Footer widget enabled areas that we covered before to populate your footer with content. To update the bottom bar of your website, from within the Footer options navigate to the ‘bottom bar’ tab. Here you can amend the background color, text color, etc. To amend the text, click on the ‘edit footer credits’ box and type in the information you want here. The Divi Builder is Elegant Themes’ custom built drag and drop page builder, and is one of, if not the best in the industry. You’ve seen how easy it is to bring in modules, rows, sections, pages, and entire pre-built website designs in just a few clicks. And now, we’ll go through how to customize these designs to suit you. We’ll also go through how you can create your own designs from scratch. The Divi Builder has both a back-end editor (which we prefer working with), and a front end editor which is great for beginners as it allows you to see exactly what you’re doing in real time. Once the Divi Builder has been launched on a page or post, you can use the front-end builder or visual builder by clicking on the ‘Use visual builder’ button. This will take you to the front end version of the Divi Builder which allows you to view changes in real-time. Follow the button below to access the free video tutorial and documentation on using both versions of the Divi Builder. When you have your website looking the way you want and you’re ready to launch, there’s a few best practices that you should follow to ensure you get the best results. Once you’ve done that, we recommend watching our step by step video on how to add your website to Google Search. This will help make your website discoverable via search engines like Google. We would also recommend installing Google Analytics on your website. Fortunately, we’ve created a free step-by-step video on how to do this as well. Using the Divi theme, you can add the required tracking code within the Divi Theme Options tab, under integrations. We cover how to do this in the video. And that’s it for our How to Make Your Own Website 2018 & 2019 tutorial. We hope you found this step-by-step WordPress tutorial helpful and are well on your way to launching your new WordPress website.